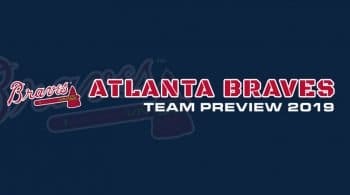 The Braves are on the rise with a group of veteran and young up and coming hitters. Ronald Acuna Jr is a top tier talent who is on the verge of breaking into stardom. This young bat is followed by Ozzie Albies, who is a young bat bringing a good source of speed and power. When you add Josh Donaldson and Freddie Freeman in the mix here, you are looking at a very good front few hitters. They don’t strikeout a ton, and names like Ender Inciarte and Nick Markakis continue to be above average contact bats. In fact, Markakis is closing in on 3,000 hits. They will continue their catcher platoon, as Brian McCann is back in Atlanta where it all started. Tyler Flowers and him will rotate behind the dish. Atlanta is looking to be a strong offense in 2019. The Braves were top ten in team ERA last season, and while the rotation doesn’t have any elite names, they have a strong core of above average arms. Mike Foltynewicz took a major step forward last season, and 2019 is going to be a year where many see if he can move up a tier. He finished with a 2.85 ERA on the season, and had over 200 strikeouts. Folty possesses a high velocity fastball, which sets up his above average off-speed stuff. Projections look kind for him in 2019, projected for around 200 strikeouts and a three ERA. This rotation might be dependent on Folty continuing a positive trajectory because they have some arms that are not as consistent. They made a trade for Kevin Gausman last season, who had an up and down career in Baltimore. Gausman getting out of the AL East was a huge boost to his career. He is in a better park to pitch in, and won’t have to face two of the toughest offenses in baseball, he also avoids the DH now. Gausman’s full projections in Atlanta have him on the positive side, and we should be buying in given the talent he has flashed. Julio Teheran continues to pitch in Atlanta after being a trade target the last few seasons. He surprisingly had under a four ERA last season, and 2019 might be where his luck starts to run out. He is a flyball arm who has had a drop in velocity over the last few seasons. Projections have his ERA up over 4,50, which makes sense given his diminishing stuff. He out-pitched his ERA estimators last season, with a 4.72 xFIP. His hard-contact was up 6.5% from the prior season, and it is hard to buy into success for him again this season. Sean Newcomb is a solid lefty who has had issues with control. It works for him at times, as he had above average strikeout numbers and a very strong stretch during the middle of the season. Newcomb had a 3.90 ERA, and hovering around four is where he is projected again. We are always interested with these younger arms to see who can make that big leap in production. Newcomb is a name to keep an eye on. Touki Toussaint is going to likely lockdown the number five spot, although Atlanta might limit him and use another younger name to keep innings down.